It has long been understood that pressing or stamping is an economical method for manufacturing complex parts. Although there's a relatively high initial cost to manufacture tooling, deep drawn stamping is usually cheaper and always faster than alternative processes such as machining, fabrication and injection molding. Deep drawing takes this a step further in that it is possible to produce parts that are longer or deeper than can be achieved through conventional stamping processes. 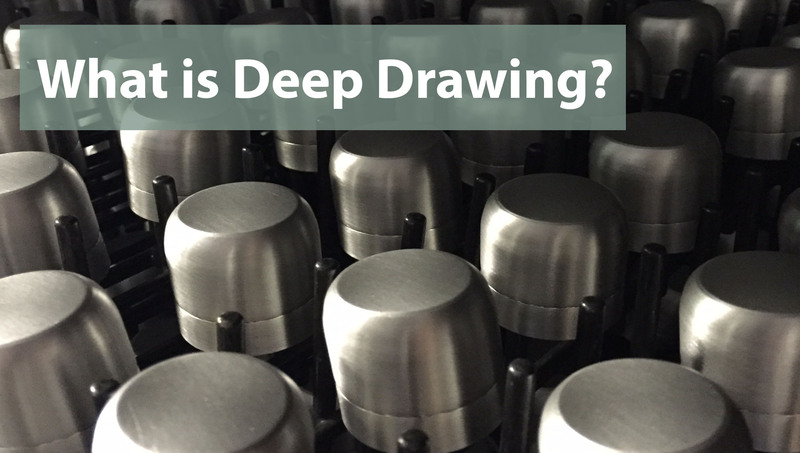 Deep drawing is a form of metal stamping where the depth of the draw is typically greater than its diameter. In practice, it is possible to produce long, narrow, cylindrical parts with a length that is significantly greater than the outside diameter of the part. Conventional stamping processes are unable to achieve such deep draws because the material’s cannot stretch sufficiently resulting in uneven wall thickness, thinning and tears. In deep drawing, this challenge is overcome by careful tool design that forces material to flow into the die during the initial stages of the deep drawing process. This ensures that sufficient material is available to achieve the final shape while maintaining the desired wall thickness. Deep drawing is performed in several stages. During the first stage, the blank will be forced into a cup shape with a larger diameter than the final part diameter. During successive stages, the part diameter is gradually reduced and its depth increased. Tooling is usually ganged together with some form of part transfer so that all operations take place on one press. Using these techniques it is possible to use deep drawn methodology to manufacture a part that's more than ten times longer than its outside diameter. The design of deep drawn tooling is crucial. Special care needs to be taken to ensure that excessive stretching does not take place, and for this reason the initial die and punch radii need to be carefully calculated. If the die radius is too small, material will not flow properly, and if it's too great, wrinkling will occur. All tooling should be highly polished to aid material flow and high-strength tool steel used for the radius at the die entrance. The clearance between the cup and tool is also critical to ensure the correct final ratios between stretch, flow and work hardening. The press speed is important because if it's too high, corner cracking will occur, but if too low, material flow will be affected. There are two major advantages of deep drawing. Firstly, production volumes are high and are only limited by the speed of the press, and press capacity usually exceeds 2,000 parts per hour. Secondly, the finish achieved is such that no further processing is required, and secondary operations such as beading, notching, chamfering and piercing can be performed within the deep draw tooling. Due to these two factors, the cost per part is low even after tooling costs are taken into account. Parts that are symmetrical with a round or oval shape and a length to diameter ratio that's less than 10 are usually good candidates for deep drawing. Additionally, deep drawn stamping can be performed with an almost unlimited range of materials including steels, alloys, aluminum, brass and copper. Thanks to the natural work hardening that takes place, parts are strong, light and can be manufactured to exacting tolerances. Most importantly, parts that are suitable for deep drawing are often ones that are difficult and expensive to manufacture by alternative processes.